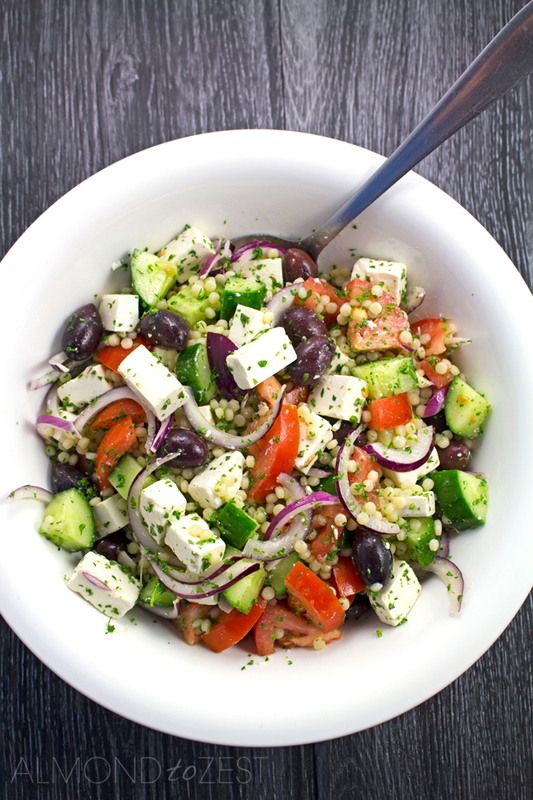 This healthy Greek salad recipe with the addition of Israeli couscous is packed full of fresh produce and tossed in a light and refreshing lemon vinaigrette making it the perfect summer time salad. You know summer has arrived when your body starts to crave huge overflowing bowls of fresh, crisp salad and your mind wont rest until your taste buds get what they want. Well my friends I have found the answer to all those insanely mind-boggling cravings. 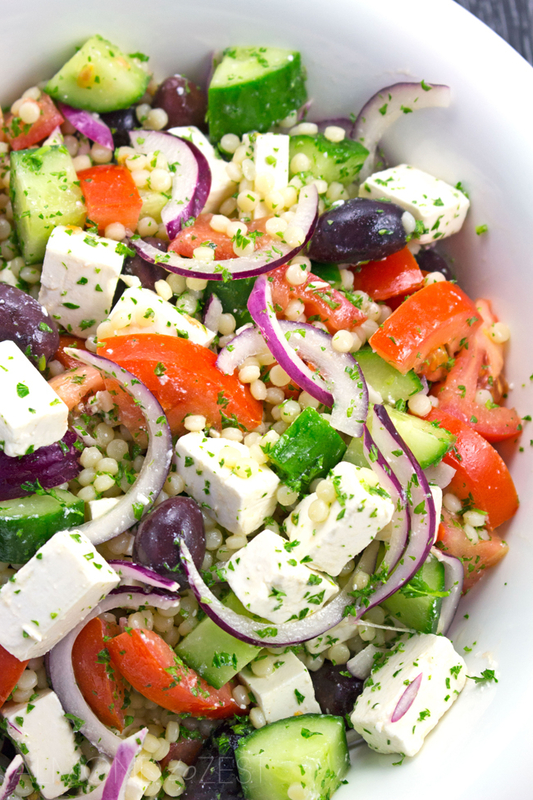 This perfectly balanced chunky Greek salad that I have scattered with pearls of Israeli couscous. 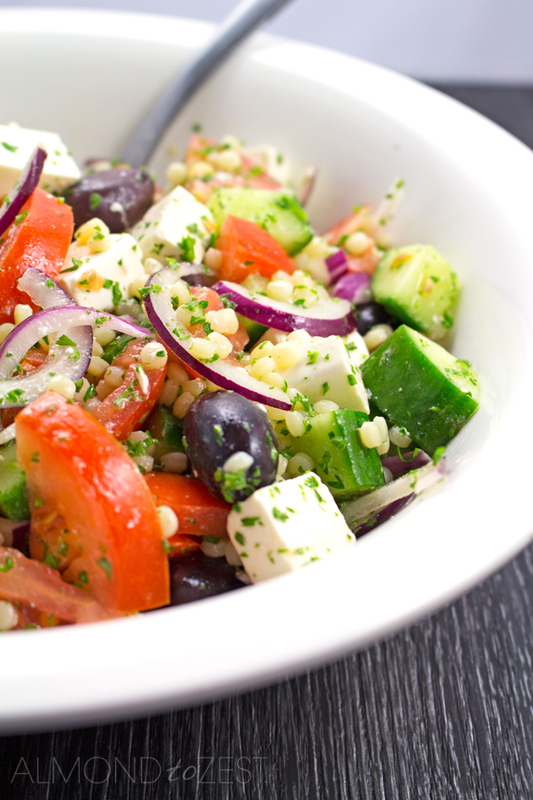 Now I don’t know about you but I like my Greek salads chunky. Forget about finely dicing the ingredients here, with this salad just cut it up into big irregular chunks of goodness. Fill your bowl with crisp chunks of juicy cucumber and bulky wedges of soft, fleshy tomato. Then throw in cubes of soft and salty feta with lots of dark, meaty kalamata olives. Now add the thinly sliced pieces of red onion, this is the only ingredient that I don’t like to be chunky in my Greek salad recipe. I mean I don’t think anybody want to bite into a huge chunk of raw onion… unless you like that kinda thing? Now for the final ingredient of this healthy salad, cute pearls of Israeli couscous. This is also known as Pearl or Jerusalem couscous and in Israel they call it Ptitim. It is little balls of toasted pasta that kinda look like pearl shaped rice. It was developed in Israeli in the 1950’s when rice was scarce and it is delicious and a much lighter way to eat pasta. Finish this salad of by tossing it all together with a drizzle of my healthy homemade tangy lemon vinaigrette. And there you have it, a quick and easy healthy vegetarian salad, that is light and refreshing and perfect for those hot summer nights where cooking’s a chore. Cook your Israeli couscous as per the instructions. Refresh in cold water, drain and set aside. Roughly cut your cucumber and tomato into ¼ moon segments. 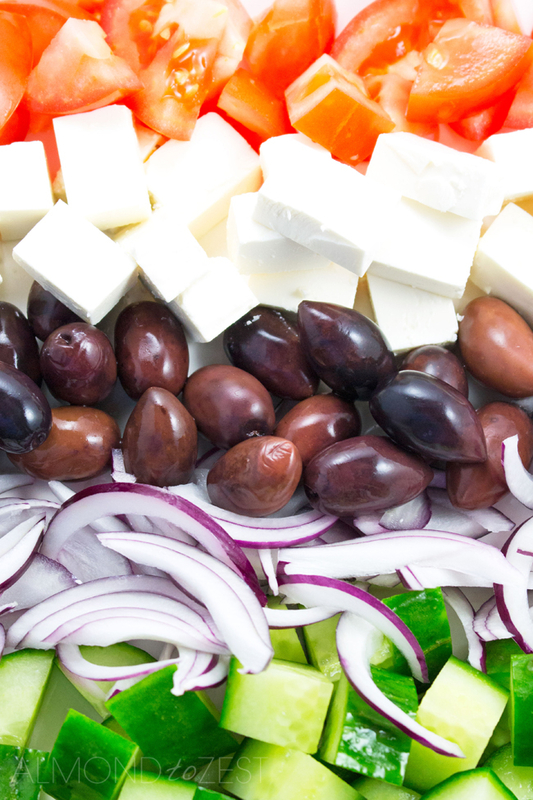 Thinly slice your red onion and cut your feta into ¾ inch cubes. Prepare the lemon vinaigrette. Take a small mixing bowl and whisk together the lemon juice, white wine vinegar, Dijon mustard and sugar. Add the olive oil slowly whilst continuing top whisk quickly. 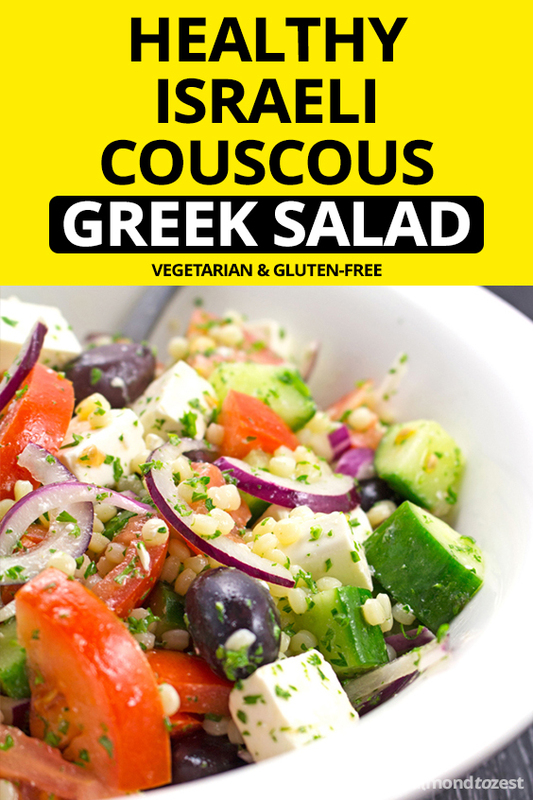 Take a large mixing bowl and put in the cucumber, tomato, red onion, feta and kalamata olives. Toss through the cooked Israeli couscous. Add the lemon vinaigrette and mix well. Season with salt and pepper and mix through chopped parsley when you are happy with the seasoning. Just made this salad for dinner today, glad I doubled it, because as I am cooking the meat I can’t stop tasting it! The flavor is wonderful! Had to put the olives on the side, kids don’t like them, but I wouldn’t think about making this without them! Can’t wait to try more of your recipes!